Quinoa is a little seed that packs a powerful punch. The World’s Healthiest Foods talks about the many benefits of this product. Although you can find quinoa at your local Wal-Mart you will pay more for it. Sam’s Club has it for a great price or you can order it through (affiliate link) Amazon , Vitacost (this is my referral link – if you sign up through it you will receive $10 off a $30 purchase), or your food co-op. If you have never had quinoa before, you might want to buy a cup or two from the bulk bins in a health food store so you aren’t stuck with something else in your pantry you’ll never use. So, now that you’ve gone out and bought this little seed you might wonder how to cook quinoa. It is very simple and you can have it ready to eat in under 25 minutes. Doesn’t get much better than that. Even though the quinoa you buy has already had most of the saponins removed, there is enough residue left that rinsing the quinoa is very important! Don’t skip or you will end up with a bitter tasting dish. If you don’t have a mesh strainer fine enough, line what you have with cheese cloth. If you are making this as a side dish feel free to add sautéed onions, garlic, and herbs in with the quinoa and liquid. Come back next week for a list of recipes to use your quinoa in! Place liquid, quinoa, and salt in a pot and bring to a boil. This entry was posted in Sides on August 23, 2013 by Deanna Michaels. 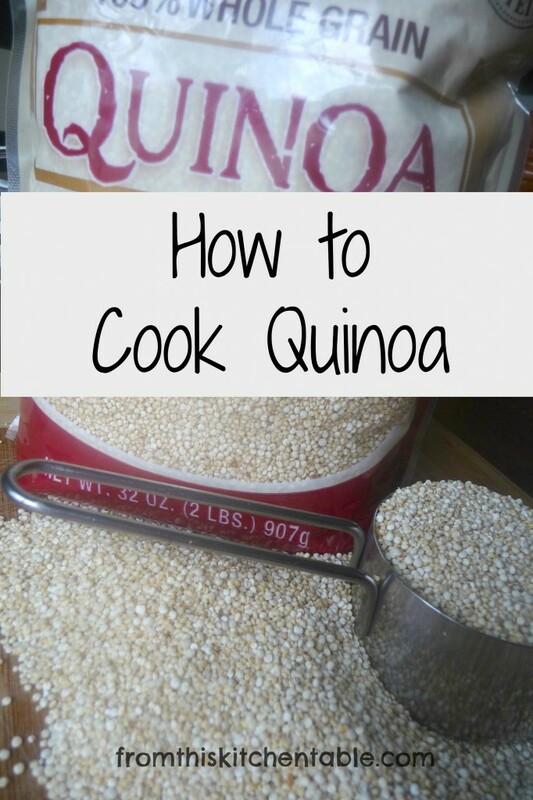 O my word I have been wondering how to cook Quinoa! My midwife told me that quinoa has lots of iron (great for pregnant ladies lol) and I should try to find good recipes. I found boxed quinoa at the store, but I’m sure there was tons of other stuff in there not as good for me 🙂 Thanks for writing! How funny! I really like quinoa. Shaun, on the other hand, doesn’t love it. 🙂 Cold quinoa based salads make great lunches. . . Thanks for linking this up with us on MMM link up party! I pinned it (2x) and shared it on the Adventures in Mindful Livings FB page! We love quinoa around here and buy ours from a Mennonite general store. We replaced our standby of grits with quinoa. Blessings, and looking forward to your quinoa recipes! I love quinoa too! I also cook it in a rice cooker and it works beautifully. If you have a programmable one you can set it to cook whenever you need it! Oh, what a great idea! Mine isn’t programmable, but I’m going to have to give it a try. Thanks for stopping by. I need to use quinoa more in my cooking! Thanks for the tips! Thanks for linking up to Good Tastes Tuesday! Your recipe has been pinned to our GTT Pinterest board! Hope to see you again next week! I love quinoa! I seem to go through phases of either using it a lot or not at all. Love quinoa salads in the summer. Hi! I’m stopping by from the Lovely Ladies Linky hop. I love quinoa! I buy quinoa flakes and have it every morning for breakfast. I don’t cook it much with other meals, but I should give it a try. Thanks for stopping by! Quinoa is really good. Oooo, great idea to have flakes for breakfast. I don’t think I’ve ever bought the flakes before, I might have to give it a try. This is absolutely the best way to cook quinoa! Letting it sit for a few minutes after its cooks makes it turn out just right. I always prefer using broth over water.